Our early athletic teams spent 35 years in the Valley for one or more sports before their departure in the 1955-56 season when they would become part of the Lumberjack Conference. It is because of the difficulty of being consistently competitive with the large schools of the Valley, that we are highlighting the efforts of the 1927-28 basketball team with great pride. This was the only season in 35 years that Tomahawk was able to bring home a team championship in basketball. If you think that this is an easy feat then take a careful look at how we have done against the Valley on both a conference and nonconference level throughout history. The team was coached by Lloyd Bohm. Team members were Paul Bebeau, Connie Winker, Maurice Parmeter, Philip Glines, Kermit Schultz, Sylvester Polege, Richard Schleif, Andy Gahan and Lawrence Haugen. Tomahawk had a 14-4 record with some outstanding competition. They opened their season with a 34-6 victory over Tripoli and then lost a hard fought battle with the Tomahawk City Team by a 28-26 score. The city team was filled with many solid alumni of Tomahawk High School and was a good indication of the success Tomahawk would experience if they could avoid injuries, bad grades, etc. Tomahawk learned from their city team and proceeded to trounce Mosinee 38-13 (a 24-3 lead at half prompted Coach Bohm to play the second string the whole second half). Tomahawk then defeated Wisconsin Rapids 18-10 (Bebeau scored 17), Stevens Point 16-8, Wausau 33-28 (Parmeter scored 11) and Medford 33-17 (Bebeau scored 19) before taking a hard loss to Merrill by a 17-16 score. This loss did not settle well with the team as they had victories of 37-13 over Rhinelander, 14-11 over Antigo (thanks to tough defense by Glines), 41-16 over Merrill (with revenge in mind Parmeter scored 12, Schultz 10, Winker 9, Bebeau 8), 37-21 over Rhinelander (Winker scores 14), 15-11 over Medford, 20-15 over Wausau and 23-22 over Rhinelander. They suffered a 26-13 loss to Rhinelander and then defeated Antigo 26-19 before being removed from the playoffs with a 35-20 loss to Wausau. Parmeter was selected to the All Tourney Second Team while teammates Bebeau and Schultz were selected to the third team. Even though they were denied a trip to State they had hung tough with the Valley and secured their only basketball championship in a 35 year career against Valley schools. Kermit Schultz was captain and the efforts of the team resulted in Paul "Sonny" Bebeau making first team All-Conference (he was second in Valley scoring with 99 points) while Maurice Parmeter was voted to second team All-Conference. 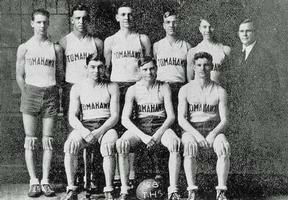 One must look back and fully realize that the basketball team of 1927-28 achieved a remarkable goal. They played well in a conference where the weak do not survive. Well done gentlemen and thanks for some great memories.